Maybe, when I was first thinking up a name for this blog, I should have just gone for “Look, I’ve Been Busy, Ok?”. This week has been a combination of football, laughing about the football, drinking, feeling horrendously hungover from drinking, laughing about feeling horrendously hungover from drinking, and then trying to sleep. Sweet, sweet sleep. Which is in no way a good preparation for sitting down and writing1. Sure, I did put together 300 words on How Metallica Are A Bunch Of Whining Pussies on Wednesday night whilst under the influence of Old McSouse’s Fizzy Seven-Percent Temporary Inhibition Reducer, but I haven’t dared to go back to see what I wrote. Back in the day, I was a bit of a Ranter, and though I’ve tried to curb that side of my personality, it does sweep back into view after a few. So anyway, I’m going to try and get some posts out this week. I have an inbox filled with suggestions, and some of them are damn fine too. First off, The Twilight Sad have been a favourite of mine since their debut “Fourteen Autumns and Fifteen Winters”. Follow-up “Forget The Night Ahead” hasn’t quite been a success (despite my initial positive thoughts), and whilst some of the standout tracks are superb, the record as a whole is distinctly sludgy and doesn’t have that clarity of rage that made “Fourteen Autumns” such a standout. Seems like the band themselves haven’t been too happy with it either. They’ve lost their bassist, and on their recent tour have only been playing a handful of tracks from it. Now they have a new EP out, named “The Wrong Car”, and thankfully this looks backward as much as forward. 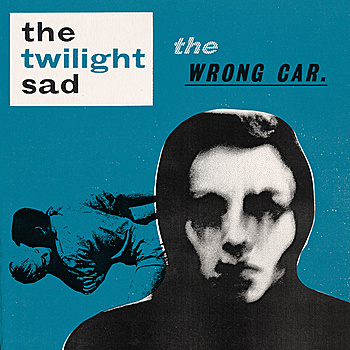 Opener “The Wrong Car” is unmistakeably The Sad (as only I call them); all churning rage and burning ferocity and noise, thwacking great balls of noise that roll down the mountainside and thump you upside your skull. “Throw Yourself In The Water Again” takes up the “Scottish Bands Using Water As A Metaphor For Being A Bit Narked Off” meme which has been mined so effectively by Frightened Rabbit over the past few years, gives it a good kicking and then takes it drinking to make up for it. The Twilight Sad – I Became a Prostitute (Acoustic) from FatCat Records on Vimeo. The acoustic versions doing the rounds are pretty decent too, so get the MP3 version of the EP if you want to give them a try. In any case, it’s good to see they’ve got lots more tracks in the bag and are working on a third LP. Whilst the last one may have been a slight mis-step, “The Wrong Car” shows they are firing on all cylinders, that they are in top gear, and they’re going in the right direction. Boom, boom. Wonder what they’d be like if they cheered up a bit? Buy The Wrong Car here (CD/MP3) . 1 Anyone who says “Never did Hemingway and Hunter S Thompson any harm, did it?” can do one, and do one right now.